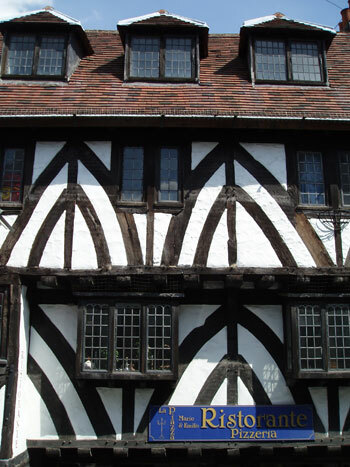 Originally a large timber-framed building running some considerable distance back from the street frontage, and built in the late 15th or early 16th century to a height of three storeys. The upper floors are jettied on the front, but not at the rear. The front elevation is particularly attractive with its downward curving timber braces arranged in pairs. These were revealed during the restoration work of 1929 when the rendering was removed, and the building extensively restored by the architects Brierley and Rutherford. Though dormer windows were inserted in 1929 there are in fact no attics, the second floor being open to the roof. The property was restored at the instigation of Mr Cuthbert Morrell in circa 1932 and transferred to the ownership of this Trust in 1957. 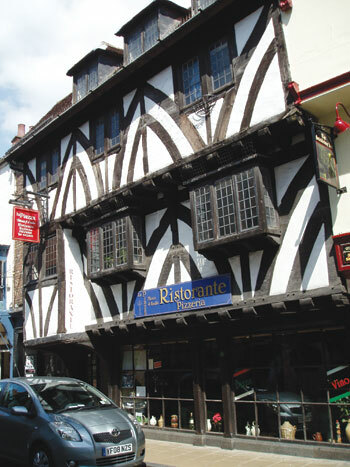 The building was for many years used as a café, and is now a popular Italian restaurant.